The more things change the more they remain the same, or so they say. Reading this book gives you a good idea of what that means. In 1947 America had just won the Second World War and was at the apex of it’s power. The Cold War was just beginning to emerge and Industry was King. No place was this more true than in Texas City, Texas- a conglomerate of chemical manufacturers and oil companies. Monsanto Chemicals, Republic Oil and Humble Oil were the chief employers and no one was going to rock this boat. Jobs, lives, industry and even the old reliable stand by of “National Security” were not going to let anything stand in the way of profits. The town was divided into sections denoting class and profession. Dockside were the workers in the chemical plants and refineries, along with the Longshoreman. Further inland and in neighborhoods with sewer and water were the elite of management. The division was soon to be erased by tragedy. On April 6th, 1947 Father Bill Roach, a Catholic Priest, was sitting with his brother John, also a Priest, when he remarked that “Blood will flow in the streets of Texas City- and soon.” Father Bill had been something of an oddity around the dock area- very unusual fellow this Priest. He was more concerned with the Social ills that confronted the city than with merely saving souls. He had, along with the towns $1 a year mayor, Curtis Trahan, approached the corporations and hatched the idea of incorporating the areas outside the town limits in an effort to tax the huge profits of the chemical companies and oil refineries. They were met with stiff opposition at every turn. The explosion shattered windows over 150 miles away. In ports like Houston, which did not allow Ammonium Nitrate to be handled at it’s ports, buildings shook. What follows is a story of the greed that allowed this to happen, and the mistakes that were made in preparing for and reacting to the fire and subsequent explosion. This would be the first time that the United States was named as a Defendant in a trial for Liability. The litigation lasted over 9 years and in the end each life lost was deemed worth $1,000. And with the exception of a few changes life went on. This is a multi-layered story. 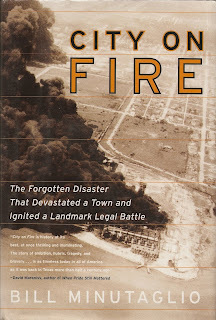 At first glance it is the story of one of the greatest industrial accidents in the history of America; beyond that there is the story of Father Bill Roach and Mayor Trahan and their visions for the future. It is also the story of General Wainwright ceding control graciously to the local leaders rather than standing on Presidential Orders to the contrary. Mr. Minutaglio has carefully crafted a vivid and accurate account of the events and their aftermath. And you can trace the story on through the years to Union Carbide and Bophal, India; the Great Lakes and Cleveland Electric Illuminating Company in the 1970’s; the Valdez in Alaska and Exxon Oil in the 1990’s. The French were right- the more things change- the more they remain the same.